It’s no surprise that the kitchen is the heart of a home and probably one of the most important rooms to consider if you’re about to undergo an extensive home renovations project. Not only is it the hub of entertainment, cooking up delicious creations, but a kitchen renovation can provide the biggest pay off – for you and the next buyer if you ever choose to sell. If you’re about to revamp the heart of your home, we wanted to give you the inside scoop from some of our very own kitchen renovation projects. From creating more useable space, ergonomic efficiencies to lighting inspirations, we’re taking you behind the scenes of some of our favourite kitchen renovation designs that our clients absolutely love! If you’re in the planning phases for a new kitchen, these tips are sure to help give you some guidance and inspiration with your renovation project. Many homes in Perth have pint sized or poorly designed kitchens and bathrooms, particularly character style homes. Many of our customers that have wanted a kitchen renovation, the number one priority is a glorious amount of space. Quite often we are faced with the challenge of working to the confines of an already small space or having to reconfigure the design to open up and create more usable space in the kitchen and/or bathroom. 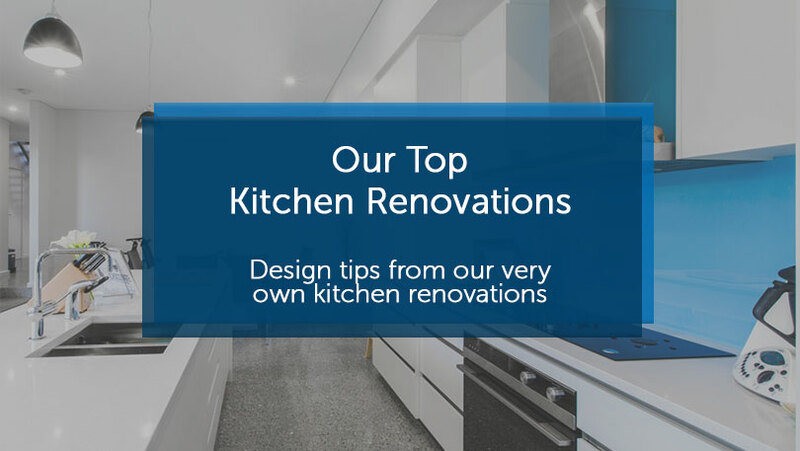 If you’re thinking about undergoing a kitchen renovation or you’re consulting with a renovations builder to help you dream up your spacious entertainer’s kitchen, here are some great ways that we’ve helped some of our clients serve up that extra space. If you’re a gas top fan you’re sure to resist this tip, but there’s no denying that when an induction cooktop isn’t in use it can serve as extra bench space! If you’re struggling for space in the kitchen during meal prep, an induction stovetop can provide space for your chopping boards, mixing bowls – unlike gas tops, they also cool quickly, and the flat surface means you won’t have to contest with any wobbling if you place a chopping board. If your home doesn’t allow you to expand practically to create more bench space, this is a handy consideration for your renovation planning. Nexus Homes Group Kitchen renovation in Baywater, Perth with an induction cooktop. Do you really need a double sink? If you rarely use the second bowl in your kitchen sink, then it could be worthwhile ditching it altogether in your new kitchen renovation plans. Single bowl sinks offer much more precious bench space, many of which are large enough to fit large pots, pans and dishes comfortably. For extra space, go for a single sink without an integrated draining rack. This Nexus Homes Group Kitchen Renovation in Como, Perth includes a large single sink which works practically with the design and functionality. From bench heights, to layouts and your choice of sinks, good ergonomics are an important consideration for kitchen designs. Creating a good flow and functionality is so important in the heart of your home which is why this is big tick box item on our renovations list. We’ve renovated – and helped to undo some very poor designs that have frustrated home owners – for many years so as a renovations builder – we understand how important it is to get this right from the get go! If your kitchen space is creating frustrations for you on a daily basis – here are a few design tips (and mistakes to avoid) to help you design and renovations to ensure you end up with a fit-for-purpose kitchen. A kitchen work triangle refers to the relationship between the main areas of your kitchen – stove top, fridge and sink. Many older homes and small kitchens are configured to accommodate this arrangement today, however, our kitchens come in many different configurations, from U-shape or large open-plan to narrow galley styles. Nowadays we tend to have more appliances so it’s often impossible to plan your kitchen according to the triangle so instead, consider which appliances you will be using the most and allow movement between them. 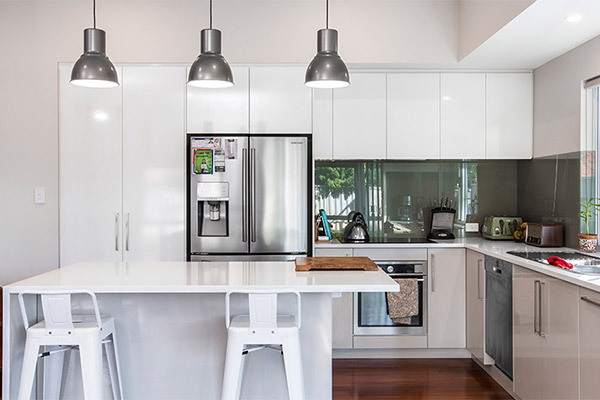 This Mosman Park kitchen renovation included a built-in wine fridge positioned near the casual and formal sitting and dining areas. The cooking and food preparation zones combine ample bench space with the stovetop, oven, sink and key appliances; while the beverage zone groups the wine fridge with the entertaining areas to allowing unimpeded movement in the main kitchen area. Planning the right space between your work space benches might seem obvious – but it’s something that is often overlooked. Too little space and you’ll feel cramped, too much space and you’ll probably get more exercise than you bargained for in your kitchen! For ergonomic efficiency and to ensure you avoid wasted space in your new kitchen, 1200 millimetres is ideal for most households. 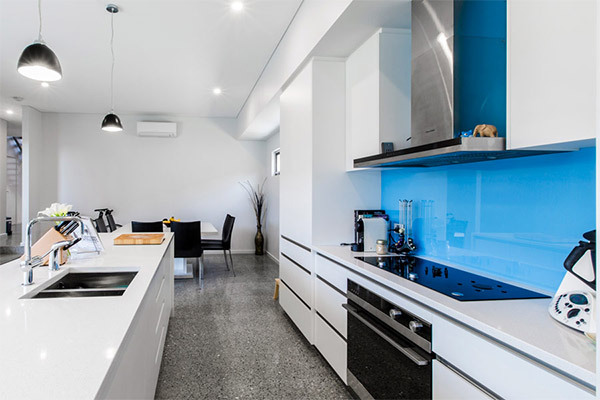 Nexus Homes Group Kitchen Renovation in Cannington, Perth. How many times have you leant forward to taste that delicious pasta sauce simmering on the stove and you’ve connected your forehead with the range hood? If so, you’ll know how important it is to position your wall mounted appliances and shelving above your head height. The minimum clearance in Australia between stove and range-hood is 600 millimetres for an electronic stove top and 650 millimetres for a gas stove. When we help our clients design their kitchen renovation plans, we always recommend that you allow a minimum distance between 700 and 750 millimetres (which can be increased) to avoid any head bumps. Another good tip, if you’re considering head height wall-mounted cupboards, it’s a good idea to reduce the cupboard width so that the doors don’t open too far beyond your bench space or, install rectangle hinged systems. Nexus Homes Group Custom-Built Home in Osborne Park, Perth. White kitchens can often feel sterile and cold, but white can also give a space a fresh, bright, open and contemporary style which is the trend we are seeing with many kitchen renovations. A question we are often asked is ‘I want a bright and spacious kitchen but how can I achieve that without it looking monochrome?’. The good news is that if you’re thinking about going very white with your kitchen renovation, there are lots of different ways you can add comfort and warmth to your space. One of the best ways to do this is by incorporating timber elements – cabinets, flooring, bench tops and furniture and accessories. Many of the homes we have renovated in Perth are lucky enough to have some beautiful period features such as wooden floors that create that natural warm element. However, if your kitchen needs an extra injection of timber warmth, here are some great ways you can incorporate this into your design. 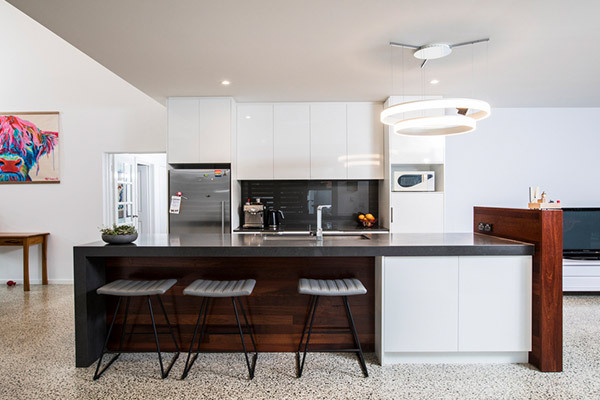 A simple way to warm up a contemporary kitchen is by incorporating timber benchtops. In this kitchen, the benchtops echo the floorboards to create a seamless transition whilst giving a bright yet cosy feel. 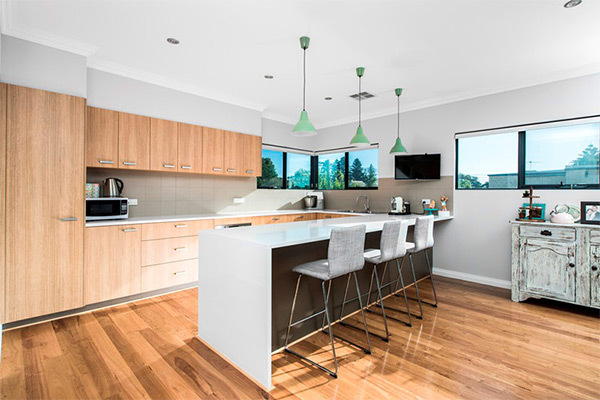 The timber benchtops used for this kitchen renovation in Beaconsfield, Perth has also created a beautiful statement that’s so clean and fresh. Nexus Homes Group Kitchen Renovation in Beaconsfield, Perth using a timber bench top to create more warmth. 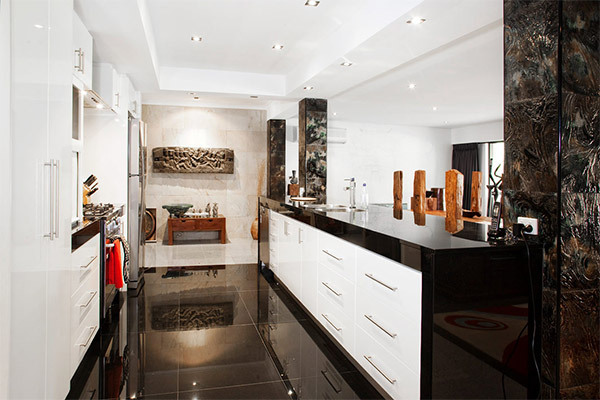 Contrast shiny white surfaces with warm wood cabinets that match the wooden flooring. 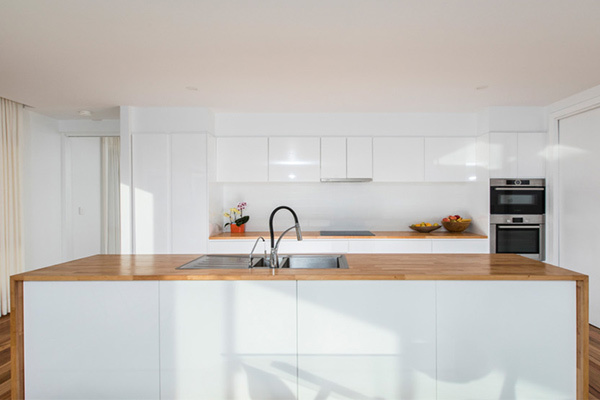 This kitchen engulfs lots of natural light which the white enhances and creates a modern contemporary style whilst the two wooden elements bring a nice warmth to this space. 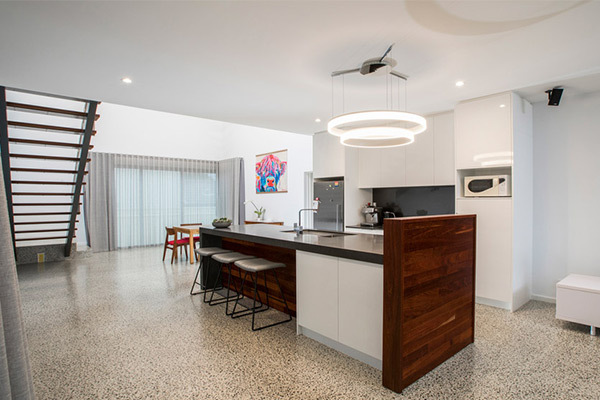 South Fremantle, Perth Nexus Homes Group Kitchen Renovation using repeated timber to create a modern and warm space. The type of lighting you choose for your new kitchen renovation will vastly depend on your layout, how you use the space and then of course, your own style preferences. From hanging pendants to tracks and wall lights, there are so many options to light up your kitchen and there really is no right or wrong! To help you with your design planning and selection, I thought I’d give you some inspiration from some of my favourite renovations to help you get started. The key to good lighting in your kitchen is to define where you’ll need it the most. Task lighting is a big oversight in many kitchen renovation projects but it’s so important to visualise your space and where you’ll be spending most of your meal prepping or eating time. In many cases, in makes sense to have most of your lighting situated over a kitchen island to serve this purpose. For maximum style and functionality, we love to utilise pendant lights batching them in a row to reinforce the function of the lighting and to create a really strong focal point. From a practical position, the extra light positioned over your work station will ensure plenty of light and brightness in the right areas of your kitchen. 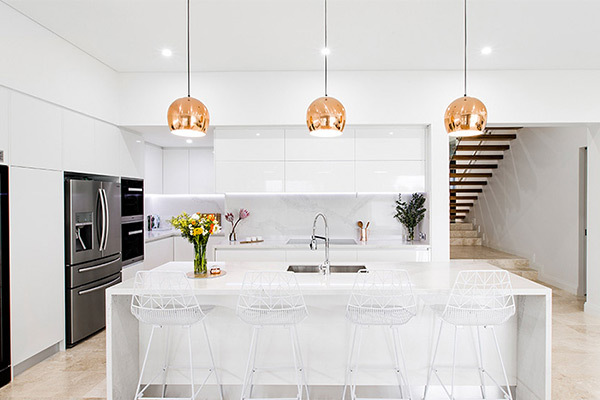 Functional and stylish pendant lights used in this Custom-Built Mosman Park , Perth Home perfectly light up the island and create a strong focal point. Whilst lighting in the kitchen needs to be practical, your kitchen renovation deserves to be a showstopper as well! Once you’ve added in your functional lighting, some of the best ways to add character and warmth to your new kitchen space is using soft ambient lighting. This could be done using pendant lights above your bench top, dining table or down lights around the room that use a soft yellow light. Alternatively, you may want to opt for a bold centrepiece for your kitchen. This contemporary chandelier offers plenty of light over the working spaces and it adds to the sleek, modern design of this new kitchen. If you’re planning a kitchen renovation, just like any other building renovation, it’s important that you get your design correct to prevent expensive fixes having to be made later down the track. 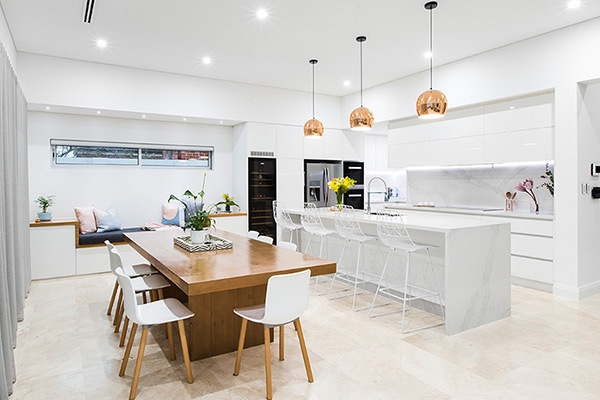 If you’re looking for an expert home renovations builder in Perth to help you design your dream kitchen – suited to your style, budget and purpose, contact Nexus today for a free design consultation.